I have submitted this spider before. She has been identified as a Hairy Golden Orb Weaver. Her abdomen has grown considerably since first noticed and photographed. The male has moved closer than before and is circled in this photograph. Unfortunately Cape Town experiences a few days strong wind in December to February and her web has been damaged by debris that has been blown against it. Thanks for the update! Female orbweavers eat their webs every morning and rebuild to keep them clean and sticky. Maybe not all of the orbweaver species do that. 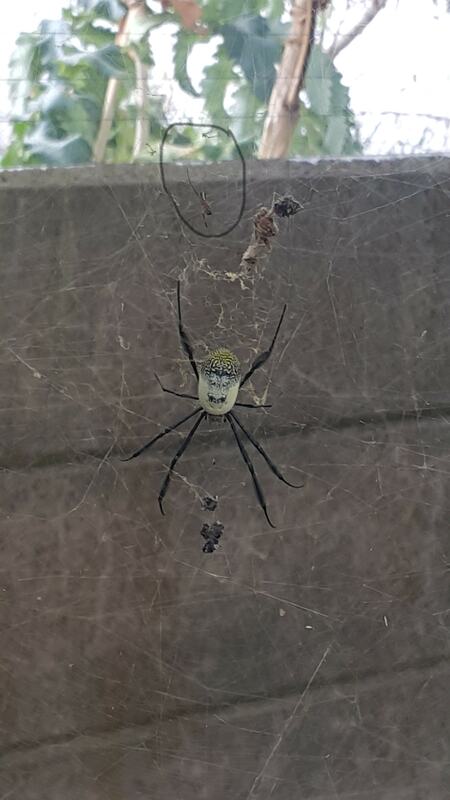 Her web is more 3D than the usual flat orb pattern. I wonder if the other spider is contributing to the web or if the female is altering it to hold the egg sacks she’ll make.